NEW YORK — United Nations members and stakeholders are mobilising to bring about universal health coverage across the world with all eyes on the UN High Level Meeting on Universal Health Coverage planned for 23 September. An informal meeting of representatives from countries and leading international health organizations at UN headquarters in New York yesterday provided an update on progress and highlighted emerging priorities for the planned High Level Meeting. Among the needs highlighted at yesterday’s forum of “Friends of Universal Health Coverage and Global Health” were getting governments to take ownership domestically and finding sustainable financing. The 23 September High Level Meeting at the United Nations is supposed to conclude with a political declaration to drive action on the issue. 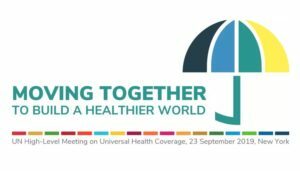 The meeting, under the theme, “Universal Health Coverage: Moving Together to Build a Healthier World,” will take place in the midst of the annual UN General Assembly week. It is considered the last chance to mobilise highest level political support for health issues before the world reaches the 2023 midpoint of the 2030 Sustainable Development Goals. A document laying out the “Scope, modalities, format and organization of the high-level meeting on universal health coverage” was approved by the UN General Assembly on 13 December, and is available here (A/RES/73/131). The next big date is a multi-stakeholder hearing on 29 April in New York. 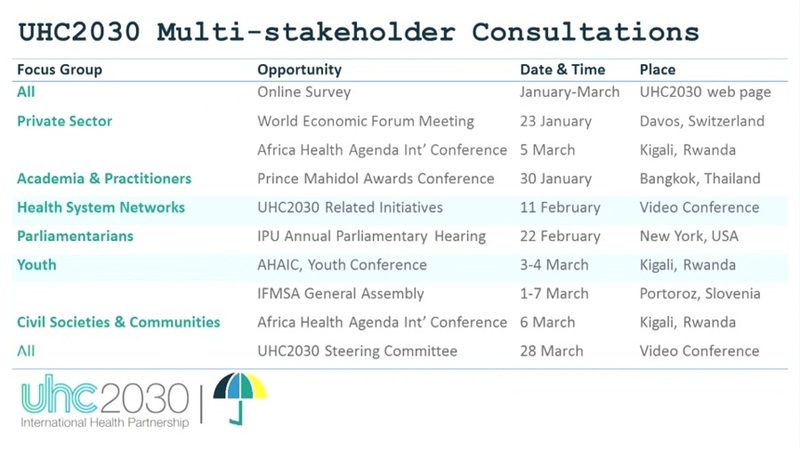 That meeting will try to capture stakeholder views and work them into the agenda for the High-Level Meeting (HLM), Ranieri Guerra of the World Health Organization said at the meeting yesterday. Guerra is the recently-named WHO special representative for the High Level Meeting. Also involved from WHO is Werner Obermeyer, the deputy executive director at the WHO Office at the UN in New York. The co-facilitators of the HLM process are Kaha Imnadze, the ambassador of Georgia, and Vitavas Srivihok, ambassador of Thailand. Six Key Asks as presented are reproduced below. A series of representatives of other agencies were asked to comment on the Key Asks, including from the World Bank, UN Development Programme (UNDP), UNICEF, UN Population Fund (UNFPA), UNAIDS, and GAVI, the Vaccine Alliance. Nongovernmental perspectives were given by representatives of the Primary Healthcare Initiative and the JSI Research and Training Institute, and the private sector view was given by the World Economic Forum. Among the member states who spoke, Mexico’s ambassador highlighted what he called “probably the most important event” on public health in the Americas this year – a gathering on 9-10 April in Mexico City where a high-level report on UHC in 21st century from the Pan-American Health Organization will be released. Other governments intervening included Bangladesh, India, Norway, United Kingdom, Brazil, Australia, Germany, and Switzerland. Another front in the process is the development of the Global Action Plan for Healthy Lives and Well-being for All, or the SDG 3+ Global Action Plan (GAP) in the context of the HLM UHC. For its part, the WHO sees itself as more supporter and “catalyser” than the “pen-holder”, said WHO’s Guerra. WHO has formed a steering committee with representation from the most senior level in the organisation, he said. Health is the foundation for people, communities and economies to reach their full potential. UHC is primarily the responsibility of governments, which ensure people’s health as a social contract. Achieving UHC is essential for inclusive development, prosperity and fairness, and requires political decisions that go beyond the health sector. Milestone: By 2023, governments incorporate aspirational health-related SDG targets into national planning processes, policies and strategies to ensure everyone can access quality health services without financial hardship. UHC is key to reducing poverty and promoting equity and social cohesion. Governments should invest in everyone’s health. Extension of geographical coverage and reaching the most marginalized and hard-to-reach populations are essential to achieving positive health outcomes. A strong system for monitoring and evaluation is needed to ensure accountability and participation. Milestone: By 2023, governments report disaggregated data to SDG official statistics to capture the full spectrum of the equity dimensions of UHC monitoring progress (SDG 3.8.1 and 3.8.2). UHC requires a sound legal and regulatory environment framework and institutional capacity to ensure the rights of people and meet their needs. Governments are the primary duty bearer under the International Covenant on Economic, Social and Cultural Rights, even in cases when they rely on private providers. Milestone: By 2023, governments introduce legal and regulatory measures that accelerate progress toward UHC. Quality primary health care (PHC) is the backbone of UHC and creates trust in public institutions. Expansion of health coverage must be accompanied by investments in the quality of health services. People should be able to access a full spectrum of safe, quality services and products in their community, delivered by well-trained, well-paid, culturally and gender-sensitive health workers. Milestone: By 2023, the coverage of quality essential health services has been delivered to one billion additional people (SDG 3.8.1). Current funding levels are insufficient to achieve UHC by 2030. Governments need to increase domestic investment and allocate more public financing for health through equitable and mandatory resources. Governments must improve efficiency and equity in the use of existing resources and reduce reliance on impoverishing out-of-pocket payments. Development assistance to health should reduce fragmentation and strengthen national health financing capacities. Milestone: By 2023, governments adopt ambitious investment goals for UHC, make progress in mobilising domestic pooled funding and reduce catastrophic health expenditure (SDG 3.8.2). All countries must take active steps to meaningfully engage non-governmental actors – particularly from unserved, underserved or poorly-served populations – in shaping the UHC agenda. Solutions for each country must be tailored to context and population needs. The international community and global health partners should unite to support countries to build a healthier world. 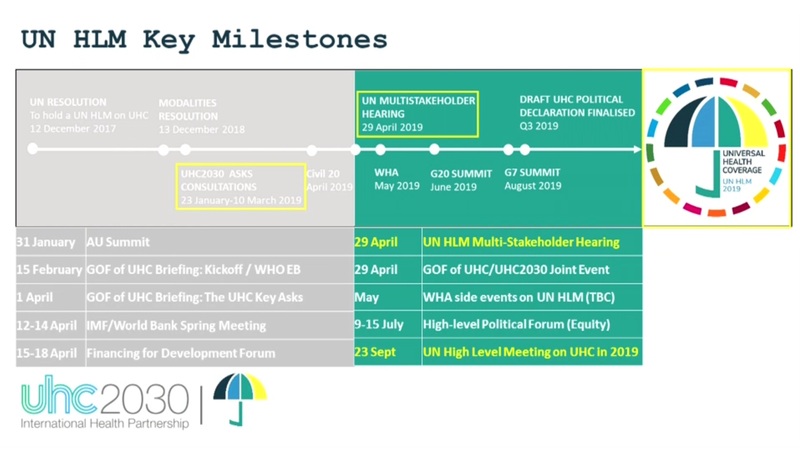 Milestone: By 2023, all UN Member States endorse the UHC2030 Global Compact and establish multi-stakeholder platforms to ensure the involvement of civil society, communities and the private sector, in regular policy dialogue and review of progress with all government actors.